As part of the plan for soil improvement here at The Community School, one of the major changes I am making is an effort to transition the farm cultivation practices to that of "no-till". This plan has rightly gotten me the nick-name "Kim No Till". Being a no-till farm means there needs to be a lot of compost available for use in the garden. And one thing that is pretty important for a balanced, quick-to-break-down compost is manure - or "manuah" if you're from these parts. While I will need to bring in off-farm compost for the first season or so, I will be focusing on strengthening our on-farm production and finding ways to supplement the fields in other ways while still not tilling. One solution: PIGS! I will be adding a few little piggies to the crop rotation plan, setting them up on the season's "fallow" parcel: growing nutritious cover crops for them to forage and "till" up the soil with their noses - pig power uses much less fossil fuel than the tractor and bacon tastes way better than motor oil. 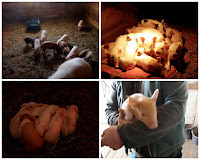 The farmer at the Remick Farm Museum has a few pigs for sale (49 so far with another litter due next week!) I stopped over last week to check in on my litter... aren't they fun?! Three little pigs will be living at The Community School this summer. Let me know if you want to get some organic, pastures pork this fall!